It feels SO good to say that! We had a few teaser Spring days recently, but as I type this at 1 AM, we have a chance of snow in the Pittsburgh area. Every winter, the urge to move gets much stronger! Hopefully, warmer days are on the way! 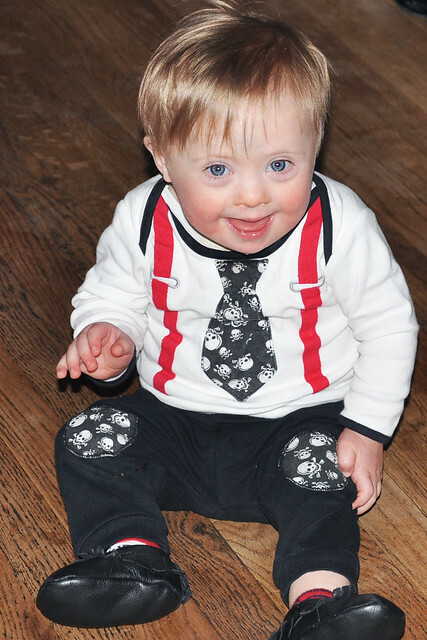 Tomorrow is World Down Syndrome Day! Two years ago, that day meant nothing to me, but now it means so much. On this day (3/21, which represents Trisomy 21), people show their awareness by wearing funky socks. They can be mismatched socks or even 3 socks for 3 chromosomes! 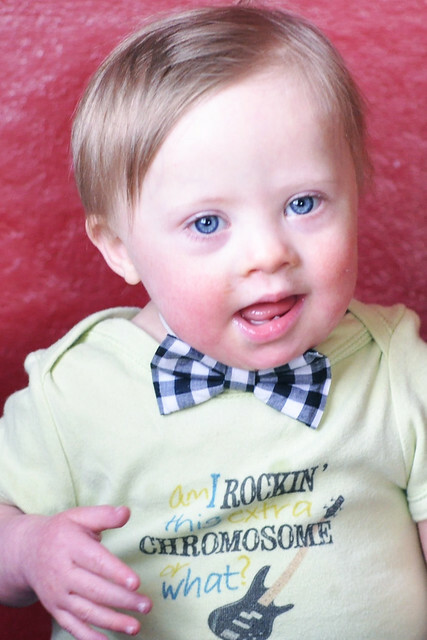 The point is to get people talking about Down Syndrome. Please show your support tomorrow by rocking your funky socks. Liam has been wearing them all week! If you follow me on Instagram, and want to show your support to Liam and all those awesome people out there, please share your picture with me by using the hashtag #Socks4Liam. We loved looking at everybody's pictures last year! 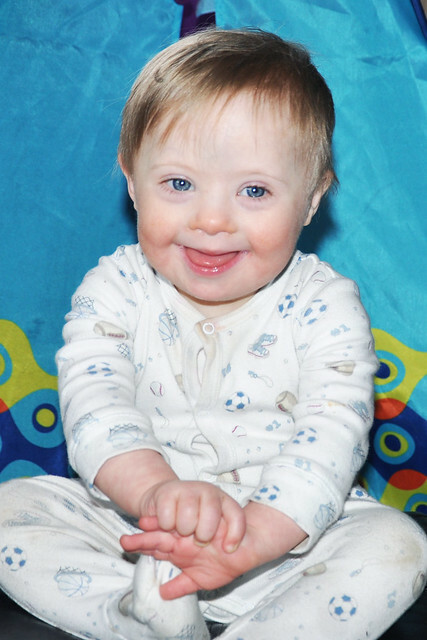 There are so many misconceptions about Down Syndrome (I admit, I was once guilty! ), so there's a lot of work to do. Just remember, person first. Look past the disability. 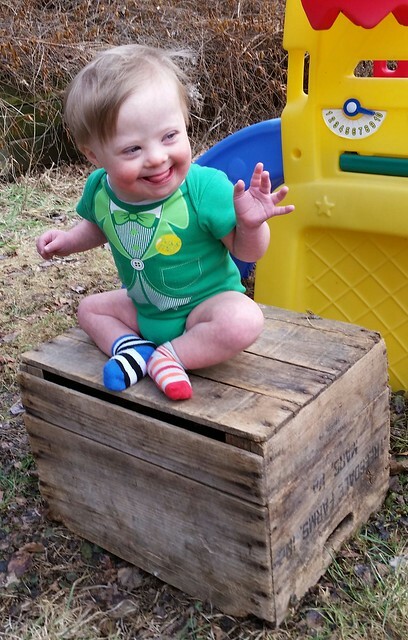 Now, more than ever, people with Down Syndrome are showing just what they are capable of! 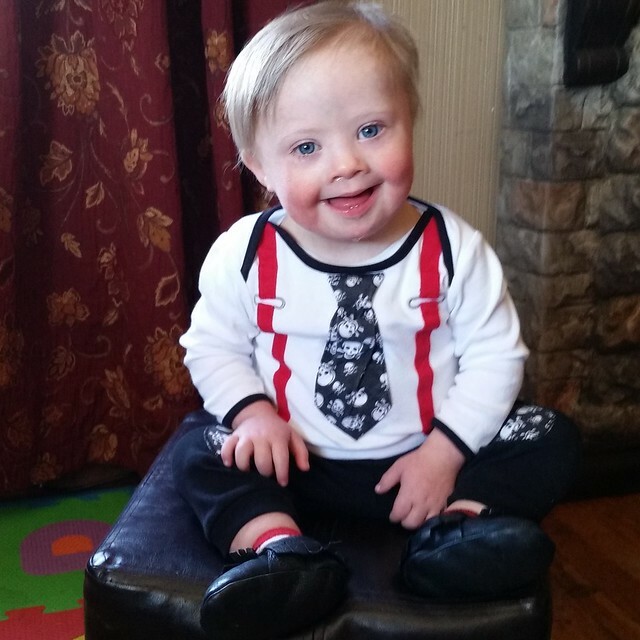 Sweet little Liam rocks my world, and we hope you'll help spread awareness on this special day! We had the best St. Patrick's Day this year! Seriously, it was my favorite ever. 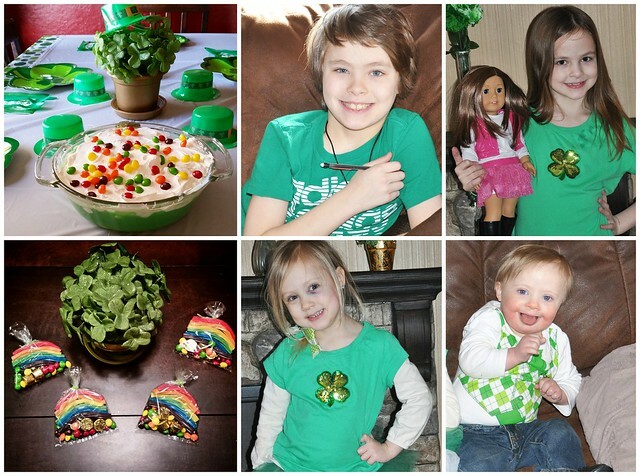 From all the new decorations to the special treats to our annual St. Patrick's Day dinner, everything was perfect! 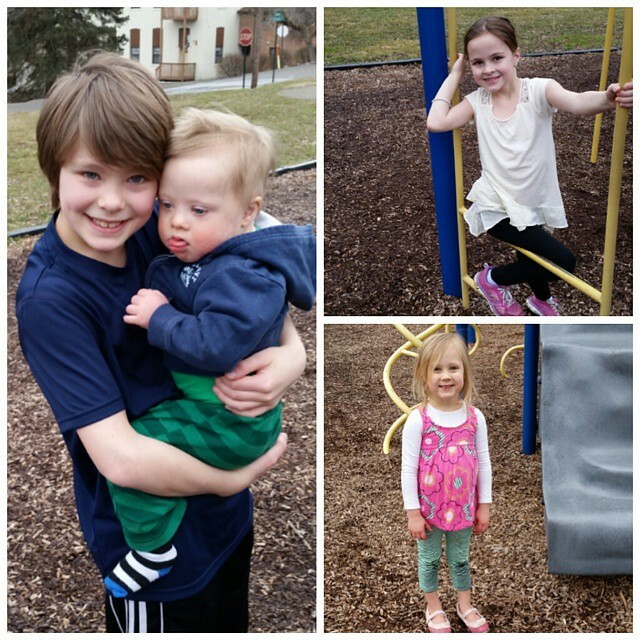 Weather warm enough for trips to the park! We stopped on the way home from picking Dylan up from school on Monday and Wednesday afternoon. The kids were so thankful to run around in the fresh air! My SUPER tough girl, Lily. On our trip to the park on Monday, she and Dylan had an accident on the slide. 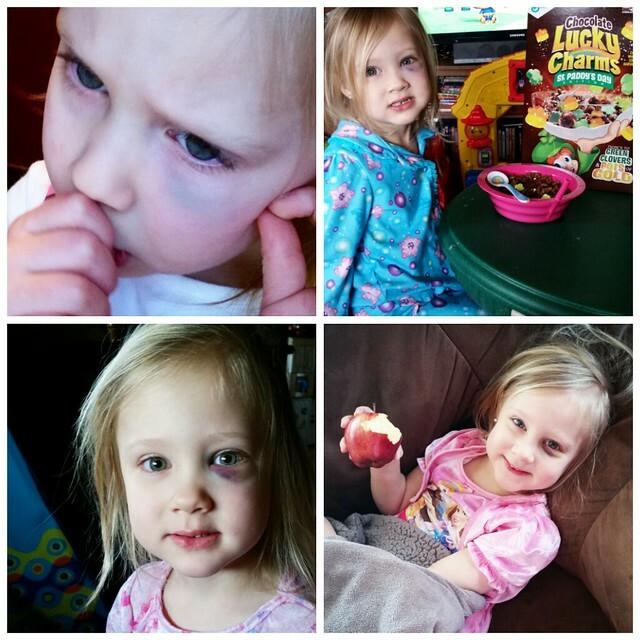 Her nose started bleeding, and the area under her eye immediately puffed up and started to bruise. Needless to say, our trip to the park was cut short. She only cried for a few minutes, then said it didn't even hurt. She hasn't complained a single time! It looked the worst on Tuesday and Wednesday. Today, she was thrilled because it looked like a rainbow!!! My sweet baby boy turned 19 months old on the 18th! I can't even put into words just how much I adore him. I never thought I could handle being a special needs parent, but I would take several more just like him! His beauty, his love, his sweetness, his joy...he takes my breath away. 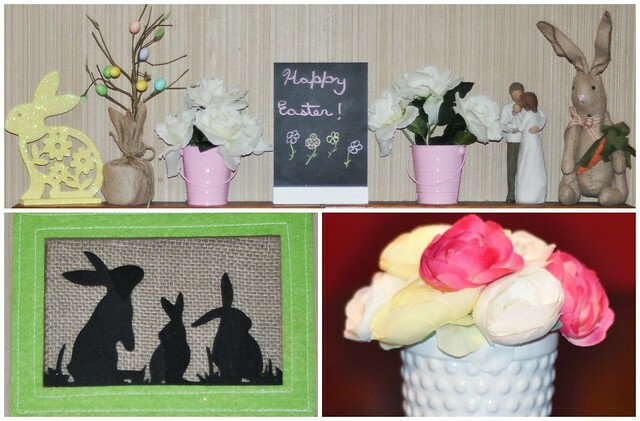 Little touches of Easter and Spring are appearing around the house! I put away the St. Patrick's Day decorations on Wednesday night. I bought a few new things for Easter, so I put them out right away. I still have 3 boxes to bring down from the attic! It makes me so happy! I am so excited for Easter, warmer weather, spending more time outdoors, and all the Spring activities. Happy Spring and Happy Friday, friends! Enjoy your weekend! Your kids are just the cutest! 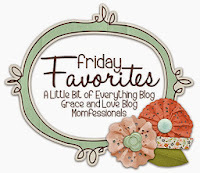 I have loved reading your story and so happy to have found you on this link-up! I love these! We will rock socks for Liam tomorrow. I'll tag you :) I loved the sweet pix you posted of him crying but it is good to see the smiley ones! Blessing sweet lady! Your children are beautiful! We will have to rock our silly socks tomorrow! Thank for sharing about awareness day. Stopping by from the link up. That poor sweet girl! You're kids are SO adorable, my goodness lots of love there, you can sure tell! Hopped over from Oh Hey Friday - have a great weekend!! Look at his tiny feet!!!! <3 Can I ask about the mismatched socks? I understand the 3/21 thing, but is there a significance in mismatched socks? Or is it a "just because" thing? Have a great World DS day!! Hope you get lots of pics from Liam's "fan club" LOL. I don't have IG myself. Oh well, I'll join you in spirit. His feet are tiny...still too small for "real" shoes. Hopefully soon! Here's a link where you can read about the reasoning behind the mismatched socks: https://www.worlddownsyndromeday.org/lots-of-socks I hope that helps!!! Poor Lily! 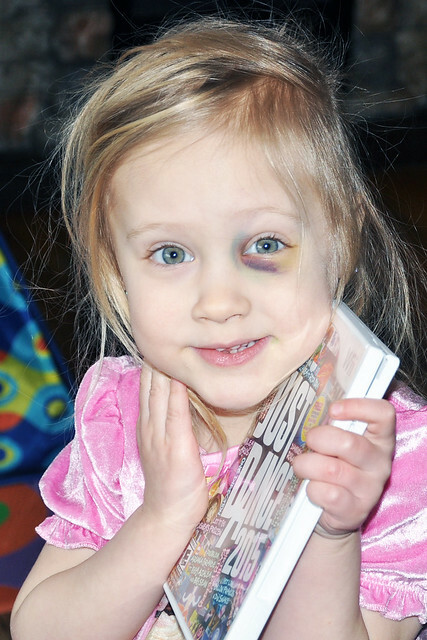 She is one tough little lady. I love all of your St. Paddy's day picks. You all really did have a great day. I love Spring too....To bad we have more snow coming! boo!!! I forgot to post my picture of my socks Saturday!!! Love those little touches of Easter! Thank you! This winter weather needs to go away NOW! I am so excited about Spring! !